Stay tuned for upcoming events for BeatBox in near future. 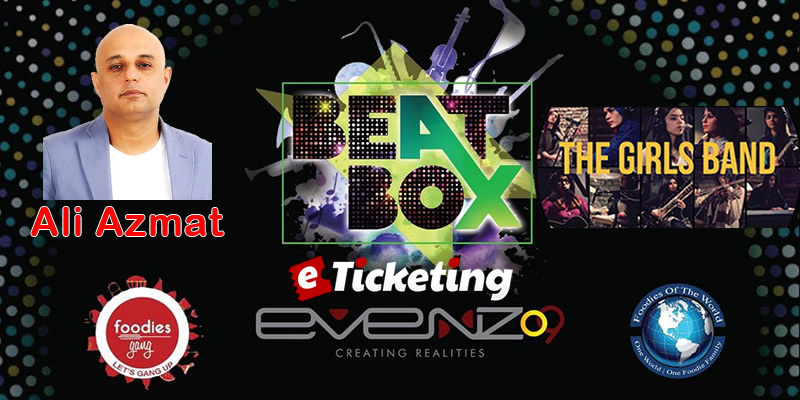 Music fans and food lovers get ready BeatBox on 18 March 2017 at Royal Palm Golf and Country Club in Lahore. Ali Azmat and The All Girls Band (Nescafe Basement fame) will perform on the same show. This event will bring great Music and delicious Food together. It is organized by Evenzo9 and is sponsored by Foodies Gang and Foodies of The World. Evenzo9 are Event planners from Lahore who deal in Events, Celebrations, Corporate Brands, Activation and PR. We're a premier event management organization striving to ensure that your special moments in life become amazing & memorable. The aura we create and the swift execution enables our clients to live in the moment. Terms & Conditions : Evenzo9 reserves the right of the admission to the event and venue. Best Viewed at 1024 x 768 pixels and above. This Page loaded in 0.08964 seconds on Tue, Apr 23, 2019 (21:21).